"When the Vatican has a principle, no sacrifice is too great." Forced reproduction must be sugar-coated. Women are the collateral damage of the Vatican's ban on effective contraception and they must be talked around. The Vatican is using both a new theology, the "culture of life", and the specially manufactured Saint Gianna to try to convince women that it's noble to die while producing children for the Church. At a time when daughters were given in marriage to cement alliances between families or states, this was an important new power. If the Pope didn't want an alliance, treaty or larger territory that nobles or kings intended to form, he could annul the marriage, which would void the contract. Or the reverse could happen and the pope could refuse to grant an annulment. This was the fateful decision of Clement VII when Henry VIII of England wanted to end his marriage with the aunt of a far more powerful ruler, the Holy Roman Emperor, Charles V. The Pope pleased the Emperor, but lost the religious allegiance of the King. By making marriage a sacrament the Church inserted itself into marriage. 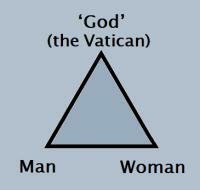 It became a triangle between a man, a woman and the Vatican. Religious demographics, however, are not going to convince a woman that it's a good idea to let herself be bred to death. What was needed was a model to convince her that this was the noble thing to do — in other words, a saint. There are many candidates, of course, but few have the right social status. For instance, "Mama Rosa", the farmer's wife with two years of schooling, was not going to become an international role model, despite her nine children and two adopted ones. She only became "blessed" in 2004, despite dying thirty years earlier than a more prestigious candidate who that same year got canonised. This is Gianna Beretta Molla who was set on the fast track to sainthood the year after John Paul II first mentioned the "culture of life". Since the idea was to make it glamorous to die in childbirth, the Vatican didn’t choose a poor woman in Africa, where most of these preventable deaths occur. Instead the Church selected an Italian paediatrician married to an engineer, who also happened to have three photogenic blonde toddlers. According to the Church account, Elizabeth Comparini, who lost her amniotic fluid early in her pregnancy, was told by doctors that the chance of her baby surviving was “nil”. Yet by praying to Gianna Molla she was able to deliver a healthy baby, after all. However, a study published a couple of years later shows that losing amniotic fluid doesn't necessarily doom the baby. Shorn of the medico-religious hysteria , it seems that, following treatment for a common (and generally not very threatening) condition early in her pregnancy, and several days after giving birth, she died from an infection (septic peritonitis). Sad, but not, on the face of it, particularly saintly. However, the success of modern obstetrics has limited the pool of martyrs to motherhood available to the Vatican, and Gianna Beretta Molla would have to do. Once she was beatified in 1994 by John Paul II, the next step was sainthood, which required claiming that she had worked a miracle after her death. This is the Church account of the miraculous cure of a pregnant woman who appealed to the Blessed Giana. It was deemed sufficient to elevate her tos deemed sufficient to elevate her to sainthood. The same year John Paul II set Gianna on the path to sainthood, he published the details of the theological part of the campaign. This was his 1994 “life-at-all-costs” encyclical, Evangelium vitae. This document reveals a two-pronged strategy. Not only does it effectively exhort women to bear children until they drop, it also obliges Catholic voters, judges and legislators to obey Vatican teaching in their decisions and their votes (§ 73). In other words, not content with urging women to reproduce, it also tries to ensure that the laws of the state conform to those of the Church, so that women have no other choice. So strategically brilliant is this “culture of life”, and so blinding is its consistency, that it has been successfully urged on an increasing number of other conservative religious groups. (The only stumbling block for US Evangelicals seems to be a reluctance to renounce capital punishment.) 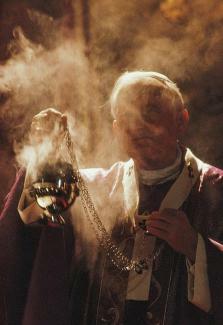 This, in turn, has given the Catholic Church useful allies worldwide. 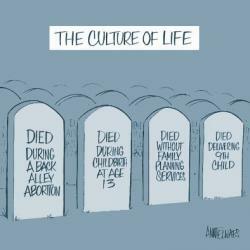 The second-last picture is after a cartoon by Ann Telnaes. 1993 concordat with Malta, article 4.1. etc.